I’ve been baking a lot lately. A LOT! We taught our first bread baking class a couple of weeks ago and it seemed a great success. We’re looking forward to the next round of classes in May. The preparation for the classes along with the recipe research has been exhausting and yet at the same time exhilarating. Our “office” desk is lined with all the cookbooks we have on bread baking along with a large handful of books we’ve checked out of the library and I’ve been scouring the web for even more. Just looking at the spines of all those books gives me a much-needed mental boost to continue baking and our oven hasn’t gotten much rest as a result. 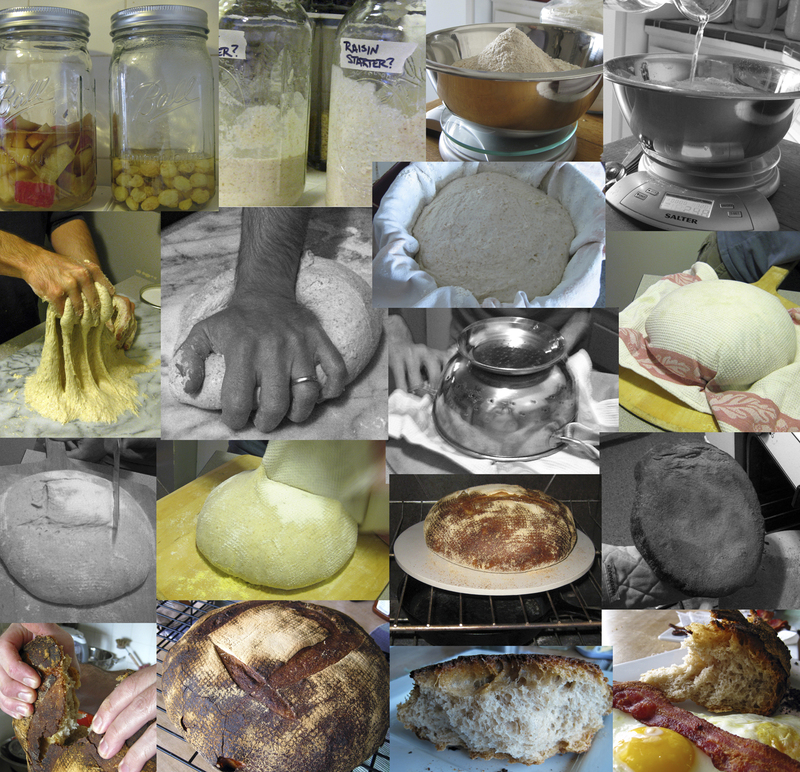 A collage of the steps in bread making. 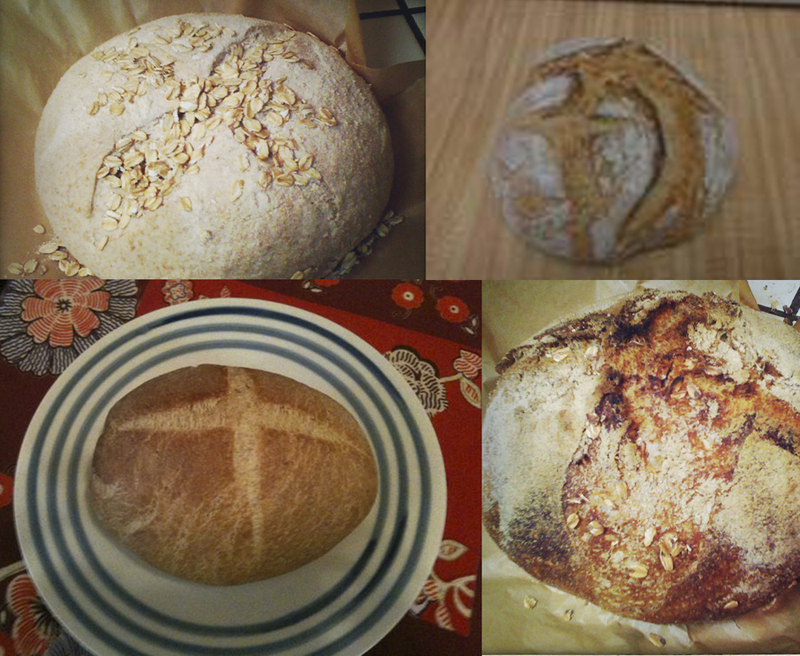 I’ve been experimenting with baking bread using “harvested” wild yeasts. I have one yeast starter made of a chopped apple and peel that has a very sweet vinegary smell. I made another out of golden raisins that first developed a very sour ammonia smell that has mellowed to a sweet earthy yeasty aroma. We’ve tried harvesting yeast from juniper berries in the past, but the only thing we created was a bacteria farm that smelled worse than dirty socks. We’ve tried to capture yeast out of thin air, unsuccessfully. This time, using William Alexendar’s leavin method from 52 loaves and the yeast starter made from golden raisins and one from apples, I’ve produced two wonderful loaves of bread. The starters seem to be thriving now and will likely be a source of many loaves in the weeks and years to come. I’m looking forward to experimenting with different yeasts, including Chad Robertson’s method of just using the yeast that collects naturally on his hands. The gnarly beasts. Loaves second and third. The challenge I’m facing now is in the transferring of the dough from the basket to the peel and then to the oven. With my first loaf of bread I tried something non-traditional in baking: I dusted a lot of corn flour over the bottom of the bread while still in the basket. Next, I placed the peel on top of the basket and then, in one quick swoop, flipped the dough-filled basket over to transfer the dough to the peel and then, with a quick tug of the peel, the dough was in the oven on a heated pizza stone. The only problem was that the bottom of the bread had a lot of flour on it and it just wasn’t crisp enough coming out of the oven. With the subsequent two loaves I’ve tried the traditional method of dusting the peel and then flipping the dough onto the peel and then again sliding the dough from the peel to a pizza stone that has pre-heated in the oven. My first attempt at this method resulted in a fold over of the dough and my next attempt wasn’t much better as the dough oozed over the edge of the stone and between the wires of the oven rack. While both loaves of bread turned out gnarly and twisted they both tasted great. The bread created by members of our first class. Top – L to R: Kathleen (before), Joe. Bottom – L to R: Jess, Kathleen (after). Once I feel like I have my dough transfer method down to a science I’ll be sharing the bread recipe with others on our blog and in another baking class. So, stay tuned for more in our ongoing quest for the best homemade loaves and congratulations to the bread baking 101 class for their successful loaves! I hope we have inspired you to keep baking. Hey guys, a good source of yeast for your starters may be bottle conditioned beers. In fact, if you culture a Lambic you’ll get wild yeast (Brettanomyces- don’t know how it would bake). But a good Dubbel yeast would likely yield good bread. May I add on to your recipe? For shtomeing Italian style. Saute diced onions with ground sausage and one or 2 diced small tomatoes and olive oil until all is at least half cooked (since it will be going into oven it will continue cooking but I prefer it cooked thru, add cooked and drained spinach, stir together, drain well in colander, (but save that liquid will come in handy to flavor a sauce if you need later), let cool a bit otherwise moz will melt then mix in diced or ground mozzarella, a hand full of parmigiano cheese. Salt and pepper to taste. Stir well together, roll out one of your loaves, pizza style, spread sausage mixture and roll up. tuck in sides and place seam side down. May not rise the 2nd go round but try and then bake. This is good even served cold.